My husband created this invitation for me when the big "30" arrived. He even made it a surprise party, which was even better! It was one of the nicest things he's ever done for me--the attention to detail that night was out-of-this-world thoughtful. Since we all know that a great party often begins with a great invitation, I thought I'd present this a potential idea for some of your own birthday parties. While it definitely makes a statement for those more momentous birthdays (16, 18, 21, 30, 40, 50, etc. ), it could easily fly for any year really. It's a fun way to express your creativity and to set a tone or theme, if you have a specific idea in mind. Using this idea as inspiration, think of all the possibilities just waiting to be created! 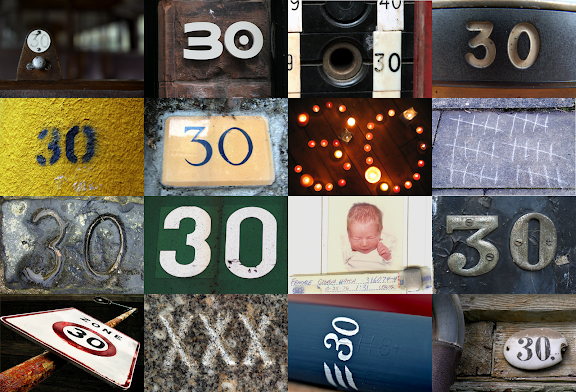 By the way, I really like the way he included a picture of me the day I was born amidst all the "30" images. You don't notice it right away, but it adds a personal element that every recipient will appreciate. So cute, what a clever and thoughtful idea. Hi, I borrowed and edited that picture for my blog, hope you don't mind. If you do, please let me know and I'll erase it!